We’re big fans of Buffalo Jackson here at BestLeather. I’ve personally been keeping an eye on them since early 2014 when I got my first pair of Yukon 500 Mile Shorts. They’ve really expanded their leather collection and I’m always running across great products. 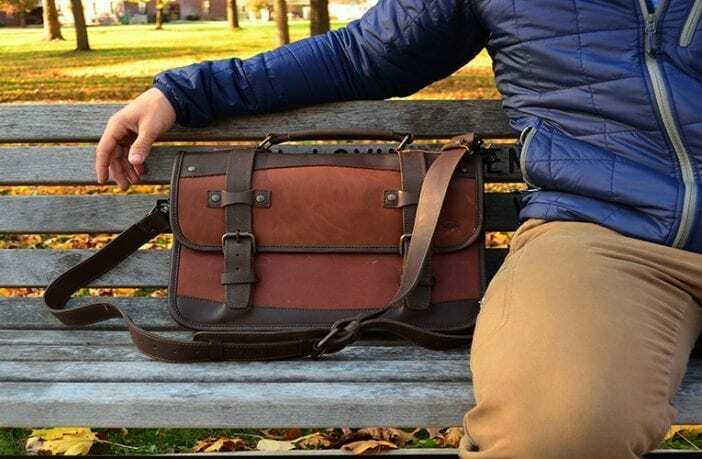 Today I’m taking a look at their Denver Leather Belted Briefcase. The Denver Brief is made from full grain cow leather. The model we’re looking at is called Autumn Brown and Dark Briar, hower it is offered in a few other finishes. Nylon thread is used for stitching the panels and we also see antique brass finished rivets located at high stress areas. The interior utilizes a more forgiving suede. The top flap uses leather straps and a heel bar buckle. This bag measures 15.5″ L x 11″ H x 7″ W and weighs 6 pounds. They are handmade in Mexico. This bag in my opinion works best when you usually don’t need much else besides the essentials. If you’re in an office and drive a car to work, this bag works. I say that because when you’re in an office and drive you can keep your daily support items in those places (i.e lunch in office fridge or coat in car) and retrieve when needed. This bag will hold a 15” Laptop, a few books, thin sweater no problem. The buckles offer a very solid closure to the bag and they’re adjustable so you can really fine tune how much play you want. This bag has a open slot on the back, good for quick access to papers or tablets. The interior features 2 compartments separated by a leather divider with a crude organizer. I would really to like to have seen a zippered pocket for small loose items like USB drives or cords though. I do appreciate the leather key clip holder and the smart laptop snap that keeps it secured. The large, padded shoulder strap really makes carrying heavier loads comfortable. One of my favorite things about Buffalo Jackson’s dry goods in general is that I feel like I’m taking a little bit of the outdoors wherever I go. I could be shoulder deep in New York city, but I feel like I’m hiding the Tetons in my bag. The rich, earthy tones really set off an adventurous vibe. Visually, there’s really not much I would add or subtract. It may be too rough-hewn for a suit and tie occupation but for a student, contractor, or blue collar professional it’s a great balance between style and function. With all the pedigrees of a solid bag, Buffalo Jackson’s Denver Leather Belted Briefcase has style and durability. There is a compromise in functionality with the buckles and limited organizer, but those tradeoffs ensure a bag that will last. The price point puts it in a playing field with a lot of other great bags but few in my opinion capture that rustic allure that this bag offers. 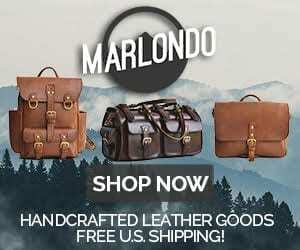 2 Comments on "Buffalo Jackson Denver Leather Belted Briefcase Review – $374.95"